One of the three tenets of Mountaineers Climbing Education is developing safe climbers. Learn what it means for the future of our climbing programs. We believe we have a responsibility to teach climbers to be safe, efficient, and competent in the mountains. That's why we embarked on a project called Progressive Climbing Education - an initiative to re-think our program design to better meet the needs of the climbing community and better achieve our mission. The first step involved intensive information-seeking, then we took the feedback to simplify our project goals. One of those goals is to "Develop Safe Climbers." Responses we received through interviews, surveys, and listening sessions confirmed that our Board, members, and the broader climbing community agree that developing safe climbers is one of our primary charges as an organization. The Mountaineers was founded in 1906 with 151 mountain climbers, roughly half men and half women. Those climbers learned and gained experience together, creating the standards for modern-day mountaineering as they exist today. In the 1920's vertical rock climbing was introduced, but as the years progressed younger climbers experienced difficulty getting involved in the club to gain the skills they needed to climb safely. They organized their own "outlaw climbs" - not sanctioned by the club - because they couldn't get on the climbs with the more experienced climbers. In 1935, Wolf Bauer and this group of younger climbers - recognizing their lack of skill and compromises in safety - launched our first climbing course. This resulted in enthusiastic climbers learning and embracing critical skills to climb outdoors safely. Fast forward to 2016. The Mountaineers has a variety of climbing courses offered at our 7 branches. Climbing gyms, guide services, and other outdoor education organizations also offer classes for the aspiring climber. Yet, our mountains and crags are seeing increasing visitation by novices. The gap between the demand for climbing education in the PNW and the education available will continue to grow. This will result in new climbers learning bad habits, more accidents in the mountains/at the crags, and enthusiastic climbers pursuing the sport despite a lack of education. It's as if we're back in 1935, only on a larger scale. The mountains, and especially the Cascades, can be unforgiving and unpredictable. Rotten rock, snow conditions, and sudden changes in weather can turn an otherwise safe excursion into an epic, dangerous one. Add in the increasing crowds (especially inexperienced parties) and the risk factor skyrockets. The Mountaineers has a responsibility to provide climbing education to as many aspiring climbers as possible, thereby improving the overall safety in our mountains and at our crags. Attention to safety: our climbing courses stress hazards and ways to avoid them, require students to prove competencies before progressing to more advanced concepts, and instill in students a propensity to err on the side of caution. Conservative decision making: our students and leaders are taught to prioritize camaraderie, the experience and safety over reaching the summit. Offering options: In recent years, we've reached more climbers through a variety of course options, including a glacier travel course for those not interested in the rock skills, a crag course for those looking to advance their multipitch trad skills, introductory courses like "Intro to Rock Climbing" and "Intro to Leading on Bolts", and occasional advanced courses like water ice and self-rescue. Publications: In addition to Freedom of the Hills, which almost every climber owns, we produce an "expert series" of books written by climbing professionals offering the most recent techniques and concepts. We don't offer enough options: We could increase course offerings for stronger climbers looking to take their skills outside, we could vary course timing to meet a variety of student schedules, and our advanced courses are few and far between. Our courses are inconsistent: Because our branches each have a unique culture, and our volunteers enjoy creative freedom in their courses, many of our standard courses differ from branch to branch (and even from leader to leader). Not only does this confuse our students, but it creates major gaps in trust among our climb leaders. Some climb leaders will only climb with students within their branch, or even with students they know, because they don't trust all students are receiving the same quality education. Some of our curriculum is rigid and outdated: Famously, The Mountaineers were about a decade behind the rest of the climbing community in adapting the friction belay device (moving away from the hip belay). But even today, our instructors often accept only one technique as viable, despite the safety advantage the comes from being able to make sound decisions, using a variety of techniques depending on the situation. Our courses fill immediately with long waitlists - we are not meeting the need: Our Basic Alpine Climbing Course in Seattle filled 160 slots in 8 hours this year. Our introductory courses have waitlists more than twice the size of the actual roster. Our large climbing parties of students sometimes create hazards for other smaller parties: We often hear anecdotally (and this was mentioned repeatedly in our survey) that the leaders of our climbing parties are rude and won't let smaller parties pass. This creates an Everest-like scenario where climbers are put at risk because they are stuck waiting below large, inexperienced parties in exposed conditions. Human-caused rock fall adds to the risk. These ideas came from our surveys, listening sessions, and Climbing Education Advisory Committee. Of course, each of these ideas requires an investment, and each has relative risk and benefit. At our town hall sessions on October 11, 12, and 13, we'll seek your feedback to gain clarity on where we should invest. Partner with The American Alpine Club to use internationally recognized techniques: The AAC has recently started outlining national climbing standards for clubs, modeled after European standards. In partnership, The Mountaineers can both offer important insights during the development process and design our courses to meet these standards. This could help us maintain consistency across branches and with the greater climbing community. Imagine if our graduates' skills were recognized nationally! Redesign climbing courses into skills-based modules: This could be in addition to, or a replacement for, our comprehensive alpine courses. Modularization could provide pathway choices for students with varying interests and skills, a greater diversity of leadership opportunities for instructors, and a variety of ongoing entry points to serve new climbers or climbers new to the PNW. Redesign the climber/instructor progression: Many of our instructors have minimal time in the mountains and struggle to provide instruction beyond select techniques. A redesign of the progression could better prepare our instructors, thereby better educating our new climbers. Develop a Leadership Development module: This will give our leaders and instructors the tools to provide physically and emotionally safe learning environments which will ultimately lead to safety in the mountains. Provide advanced climbing education opportunities through paid instruction: Our advanced climbers have few opportunities within The Mountaineers other than to volunteer. We don't have a critical mass of instructors with an advanced skill set, and see an opportunity to pay professionals to teach advanced courses, which we could offer to our volunteers as a "thank-you" and open to others who would pay full price for the courses. Overall, this could improve the caliber of Mountaineers climbing. 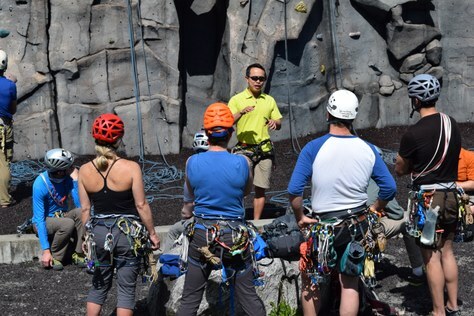 Send leaders to professional courses: Sending leaders to professional climbing courses not only offers gratitude to our volunteers but also expands their skill sets to provide more comprehensive leadership and instruction. Hire a Climbing Education Manager: This position would help build and maintain climbing instructor development, recruitment and recognition, growing our instructor pool, and expanding our capacity to serve more climbers. They would also contract guides to provide advanced instruction and provide ongoing training and support for our volunteers, including documenting, updating, and sharing curriculum and documents across branches. E-Learning: The Mountaineers recently completed a successful pilot turning our navigation workshop into an online learning experience. The results: students enjoyed the course, spent more time learning the material, and were better prepared for the field trip than those who took the in-person workshop. The online workshop was significantly less instructor-intensive. By turning pieces of our climbing education into online learning experiences, students may be more prepared for the mountains, and the reduction of reliance on volunteers will free up volunteer time to offer more iterations of our courses, thereby meeting the needs of more aspiring climbers. Invest in ongoing leadership training: This would keep volunteer leaders and instructors up-to-date on national technical standards, climbing ethics and low impact practices.